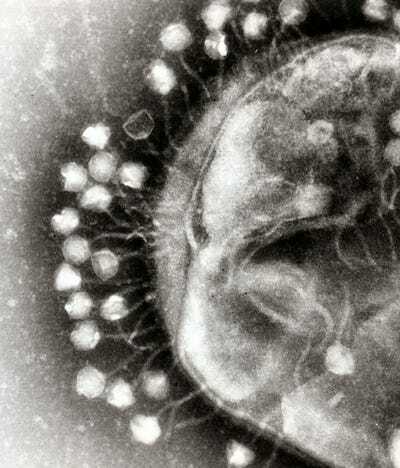 Dr Graham Beards / WikipediaAn electron micrograph image shows phages attached to a bacterial cell. We’re on the verge of an apocalyptic scenario when it comes to antibiotic-resistant superbugs. Misuse of existing antibiotics has led to bacterial resistance that could pose a major threat to our public health system. Far off on the horizon, though, could be a way to fend off resistant bacteria with something unexpected: Viruses. Not just any viruses: bacteria-killing viruses called bacteriophages, or phages for short. Discovered in the early 1900s, bacteriophages have the potential to treat people with bacterial infections. Because they’re programmed to fight bacteria, phages don’t pose much of a threat to human safety on a larger scale. While phage therapy might still be a ways off, New York Times columnist and science writer Carl Zimmer told us that they could be the solution to our antibiotic-resistance problem. That’s because the idea of fighting an enemy with another enemy, as Zimmer calls it in the most recent edition of his book,”A Planet of Viruses,” doesn’t quite sit well with the US government, especially when antibiotics are still a valid option for most infections. One of the main arguments against phage therapy is that phages can only attack one species of bacteria, which is much different from an antibiotic that can fend off many different bacterial infections at once. A possible way to counter that, however, would be to combine a variety of phages in a single treatment. Some human trials with phage therapy have been underway in Europe in burn victims with E. coli, a bacteria associated with food poisoning and Pseudomonas aeruginosa, which can cause inflammation and sepsis and in birds with Campylobacteriosis, a bacterial infection that’s spread through food to humans. In “A Planet of Viruses,” Zimmer details some of the other phage therapy trials in history, including one that took place in the country Georgia in 1963, where virologists showed that kids who were treated with phages were 3.8 times less likely to get dysentery than those receiving a placebo treatment. Phages infect bacteria by attaching themselves to their surface. But once we introduce phage therapy for a specific bacterial infection, some have worried, the bacteria could grow resistant to it. Resistant bacteria block phage receptors, confusing them and rendering them unable to latch on. However, studies suggest it takes a much longer time for bacteria to become resistant to a certain phage than to an antibiotic. Phages have some other limitations, though. For one thing, they’re built to affect only certain bacteria. That limits the amount of bacterial infections that would resond to phage therapy. And not all phages are so great for the body: some carry toxins that can do more harm than good. Plus, there are not a ton of long-term studies that look at the potential long-term effects of phage therapy. Phage therapy, while promising, is still many years away. In the meantime, the best way to cut down on antibiotic resistance is to stop using it where it’s not necessary, said Zimmer, such as in farms and in combination with inaccurate diagnoses at the doctor’s office. After all, an antibiotic isn’t going to do you much good if you have a viral infection like the common cold or the flu.